As it is St Patrick’s Day, I thought it would be nice to say a few words about the lost world of indigenous Irish cheeses. Unlike perhaps all other European countries and for the reasons outlined below, Ireland has no extant traditional indigenous cheese but rather makes variants of cheeses that originated elsewhere. Cheese and other dairy products were consumed in ancient Ireland and apparently constituted a substantial portion of the diet. References to cheese are relatively common in the Gaelic literature but, unfortunately, only rarely is information available other than the name of the cheese and have extant no detailed description of any indigenous Irish cheese variety. The modern Irish word for cheese, cáis, is derived via Norman French from the Latin caseus. When used without qualification, cáis appears to refer in the Gaelic literature to a pressed cheese. Tanag (and the similar Grus) is thought to have been a hard cheese, perhaps made from skim or semi-skimmed milk. There is an account of how the mythical Maeve, Queen of Connacht, was killed by her nephew who fired a piece of Tanag from a slingshot. Faisce Grotha (literally “compression of curds”) appears to refer to a relatively small curd-cheese which was moulded and probably consumed fresh. A story is told that an attempt was made on the life of St Patrick by giving him a piece of this cheese that had been poisoned. A number of names of unpressed cheeses also survive including Gruth, That, Millsen, Maothal, Mulchan and Gruthnuis. None of the ancient indigenous cheeses of this island have survived into modern times. The feudal system, with its self-contained agricultural communities, which flourished on mainland Europe and developed many cheeses, did not become established in Ireland. Unlike their continental counterparts, Irish monasteries developed and declined earlier and were more scholastic and missionary in their outlook and thus contributed little to agricultural development. However, the major reason for the loss of the indigenous Irish varieties was the economic and social decline following the English conquest of the country in the 16th and 17th centuries. Cheesemaking in Ireland declined further during the 17th and 18th centuries as a result of political instability and the imposition of the Cattle Acts (1663, 1669), which imposed tariffs on the export of cattle from Ireland to Britain and had the effect of encouraging the production of butter and pigs. Although buttermaking flourished, cheese manufacture in Ireland remained negligible until the early 20th century. Cheese production was substantial for a short period during the First World War but declined thereafter until about 1950 after which production began a steady increase. Ireland now produces in large centralised factories approximately 120,000 tonnes of cheese per annum and this figure is projected to increase substantially in the coming years due to abolition of milk quotas. 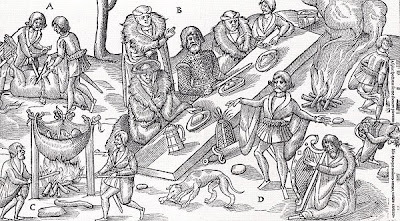 The drawing above is a famous depiction of a mediaeval banquet entitled “McSweeney Dines as the Bard Recites” and depicts a chieftain of the McSweeney (Mac Suibhne) clan, seated centre, being entertained by his bard. Perhaps one of the cheeses mentioned above was on the menu? Ó Sé, M. (1948). Old Irish cheeses and other milk products. J. Cork Hist. Archeol. Soc. 53, 82. McCarthy, J. (1992). History of the development of the Irish cheese industry. Proc 3rd Cheese Symp., Teagasc, Moorepark, Fermoy, Co. Cork, p. 1. Graduate-level courses (6-24 h) on cheese science with an emphasis on the biochemistry of cheese ripening are available are available to companies, universities and research institutes worldwide. Introduction. Cheese is the generic name for a group of fermented milk-based food products produced worldwide in a wide range of flavours and forms. Although there is no reliable estimate of the number of cheese varieties produced throughout the world, well over 1000 named varieties are recognized. Cheese is the quintessential convenience food; indeed, it has been said that there is a cheese for every taste preference and a taste preference for every cheese. Cheese manufacture, which dates from 6000-7000 BC, is essentially a method for preserving the nutritive value of milk through fermentation, removal of moisture and addition of salt. Cheese is the most diverse group of dairy products and is arguably the most academically interesting and scientifically challenging. Unlike many other foods, which are relatively biologically and physically stable, cheeses are biologically and biochemically dynamic and hence are unstable. Cheesemakers often say that their product is “alive”; although this is obviously literally incorrect, this feeling contains a grain of truth, since cheese is a bacterial ecosystem and changes considerably during maturation due to a series of biochemical transformations. If these changes are balanced, they lead to the production of a very large number of flavour compounds and thus the highly desirable aromas and flavours of different cheeses. It is fascinating that such a wide range of flavours can be produced from the basic ingredients of cheese which are milk, starter cultures, salt and often rennet. A wide range of scientific disciplines are applied to cheese: biochemistry, microbiology, enzymology, molecular genetics, flavour chemistry and rheology (the science of the flow and deformation of matter). Although cheesemaking is an ancient art, modern industrial cheese production relies heavily on the application of these branches of science to ensure a consistently high quality product. Cheesemaking is amongst the world’s largest uses of industrial enzymes, its fermentation is more complicated than many other industrial fermentations (e.g., in the pharmaceutical industry) and the maturation of cheese is biochemically very dynamic. Indeed, if cheese was invented today, it would be hailed as a triumph of biotechnology! Classification of cheese. The many varieties of cheese may be classified into a few families depending on the way in which the milk is coagulated. The majority of cheeses are coagulated by rennet, where the milk is converted to a gel by the action of an enzyme. Rennet-coagulated cheeses include the majority of major international varieties (e.g., Cheddar, Gouda, Mozzarella, Swiss, Blue, Camembert). The milk for a second family of cheese varieties is coagulated by acidification. Acid-coagulated varieties, including Cottage cheese and Quark, differ from yogurt (which is essentially acid-gelled milk) by the fact that some moisture is removed in the form of whey whereas yogurt has nearly the same moisture content as milk. Much cheese is now consumed in the form of processed cheese, e.g., on cheeseburgers. Processed cheese is produced by shredding and melting young natural cheese together with emulsifying salts into a smooth molten mass which is then cooled and moulded into the shape desired. Optional ingredients which may be added during the manufacture of processed cheese include milk powders, casein products, flavours, colours, preservatives and stabilizers. Much processed cheese is sold in the form of blocks or is moulded into large sheets which are then cut into ribbons, interleaved with film, stacked and cut to form convenient slices. Another commercial product is analogue (or imitation cheese). Cheese analogues are cheese-like products formulated from ingredients, usually a form of casein powder known as rennet casein and a source of fat (often butterfat or a vegetable oil); cheese analogues are used mainly as ingredients in consumer-ready meals. Cheese manufacture. The production of most cheeses falls into two distinct phases: manufacture and ripening. The manufacture of fresh cheese curd generally takes from about five to twenty-four hours; most cheeses are then ripened (matured) to develop the flavour and texture characteristic of the variety. Cheese manufacture is essentially a dehydration process during which the fat and casein in milk are concentrated between six to twelve-fold, depending on variety. The first operations in the manufacture of cheese curd are the selection and pre-treatment of milk. In industrial practice, milk is usually heated (pasteurised) to kill any disease-causing microorganisms which may be present although some cheese is still made from raw (unpasteurized) milk, usually on a small scale. The ratio of fat to protein in the milk is often adjusted to give the desired composition of the final cheese and, for some varieties colour may be added to the milk. Cheese is a fermented food product in which the sugar in milk (lactose) is converted to lactic acid by the action of bacteria. The strains of lactic acid bacteria used to acidify milk are usually carefully selected and deliberately added to milk as a culture known as a starter (since it “starts” acid production). Fundamental to cheese manufacture is the removal of moisture from milk through its conversion to a gel followed by contraction of the gel in a process known as syneresis. The milk for some cheeses is gelled by acidification but most the milk for most varieties is coagulated by the enzymes in preparations known as rennets. The gel is cut or broken and the gel pieces contract expressing as whey much of the liquid that was trapped inside. The solid material which will become cheese is known as curd and at this stage of manufacture is suspended in the whey. Syneresis is encouraged by acidification and is often facilitated by heating (“cooking”, “scalding”) the curds/whey mixture. Eventually, the curds are separated from the whey; whey is an important and valuable by-product of cheese manufacture. During the manufacture of most cheeses, the drained curds are then transferred to moulds of a shape and size characteristic of the variety. The curds for high moisture cheeses fuse together under their own weight but those for low moisture varieties are usually pressed to form a continuous mass. However, in the case of Cheddar and related cheeses, curds are “cheddared” before moulding during which they become more acid. The acidified curds for pasta-filata cheeses such as Mozzarella are kneaded and stretched in hot water before moulding. Salt is added during the manufacture of all cheeses as a preservative and flavouring. Most cheese varieties are salted by immersing the cheese in brine after moulding. However, the curds for Cheddar and related British varieties are cut (“milled”) after cheddaring into small pieces which are then salted using dry salt before being moulded and pressed. Blue cheeses are traditionally salted by rubbing dry salt to the surface of the cheese after it has been moulded. Cheese ripening. Almost all acid-coagulated and a small amount of rennet-coagulated cheeses are consumed fresh, directly after manufacture. However, the majority of cheese is matured (ripened) for a period ranging from two weeks (e.g., Mozzarella) to two or more years (e.g., Parmigiano-Reggiano or extra-mature Cheddar). It is often difficult to differentiate between the bland flavours and rubbery textures of freshly-made cheeses and it is during ripening that the flavour and texture characteristic of the variety develop. However, the microbiological and biochemical changes which occur during ripening, and hence the flavour and aroma of the finished product, are largely pre-determined by the manufacturing process. Cheese ripening is characterized by a number of microbiological changes and many biochemical changes which are caused by enzymes from the rennet, the milk and from the microorganisms associated with the cheese. The starter bacteria generally die off after manufacture but they continue to contribute to ripening since their cells burst open after death releasing their enzymes into the cheese. In most long ripened cheeses, wild non-starter lactic acid bacteria grow slowly during ripening and may eventually reach high numbers. However, very obvious microbiological changes occur in certain varieties. The distinctive eyes (holes) in Swiss cheese are caused by the growth of a secondary bacterial flora which converts the lactic acid produced by the starter bacteria to other products, including carbon dioxide gas, some of which is trapped in the cheese to form bubbles. Likewise, the ripening of Blue cheese is dominated by the growth of the mould, Penicillium roqueforti, which develops in fissures within the cheese, giving the blue-green veins typical of these varieties and contributing greatly to their pungent aroma. Another mould, Penicillium camemberti, develops as a felt on the surface of Camembert and Brie where it uses lactic acid, leading to major changes to the texture of these cheeses which often become almost liquid when over-ripe. The most complex microbiological changes occur on the surface of smear-ripened varieties such as Limburger, Tilsit and Münster, where yeasts grow initially and then a mixed bacterial flora develops giving these cheeses their red-orange colour and powerful aroma. The biochemical changes which occur during ripening involve the conversion of lactic acid, citric acid, milkfat and protein to a very wide range of flavour compounds. Mature cheese contains many hundred flavour compounds and the unique characters of different varieties are caused not by unique chemical compounds but rather by the same compounds but at different levels and in uniquely different proportions. The metabolism of lactic acid is of most importance in Swiss cheese, where is leads to eye development, and in white mould cheeses such as Camembert and Brie, where it leads to softening of the cheese texture. Milk naturally contains a low level of citric acid, some of which is trapped in the curd on cheesemaking and is fermented during the ripening of Dutch-type (e.g., Edam and Gouda) and some other cheeses to flavour compounds and small amounts of carbon dioxide gas which cause the few small eyes typical of these cheeses. Like all fats, milkfat is composed mainly of a type of molecule known as a triglyceride, which is made of three fatty acids linked to a backbone molecule of glycerol. However, unlike other fats, milkfat is rich in short chain fatty acids which, when liberated from triglycerides by enzyme action (“lipolysis”), are highly flavoured. Low levels of free fatty acids are desirable in most varieties but excessively high levels can cause rancidity. Lipolysis is particularly important in Blue cheeses and in some hard Italian varieties. In addition to their direct impact on flavour, fatty acids also act as precursors of other flavour compounds. Like all proteins, the caseins which form the structure of cheese are chains of simpler molecules known as amino acids. Protein breakdown (“proteolysis”) is the most important event which occurs during the ripening of most varieties. The caseins are broken down initially by enzymes in the rennet and by the enzyme, plasmin, which occurs naturally in milk, to a range of large and intermediate-sized peptides which are degraded further by enzymes from microorganisms, ultimately to free amino acids. Hard cheeses such as Cheddar contain 200-300 peptides of various sizes produced from the caseins; some smaller fragments contribute to flavours such as bitterness. Free amino acids are precursors for many key flavour compounds which are produced by a very important and complex series of reactions. Cheese ripening has been the object of considerable scientific research over recent decades. While the general pathways by which most varieties ripen are now known in some detail, it remains impossible to guarantee premium quality cheese; in the midst of science, there remains room for the art of cheesemaking. Eck, A. and Gilles J.-C., eds (2000). Cheesemaking from Science to Quality Assurance. Technique and Documentation, Paris. Fox, P.F., Guinee, T.P., Cogan, T.M. and McSweeney, P.L.H. (2000). Fundamentals of Cheese Science. Aspen Publishers, Gaithersburg, MD. Fox, P.F., McSweeney, P.L.H., Cogan, T.M. and Guinee, T.P., eds (2004). Cheese: Chemistry, Physics and Microbiology. Volume 1, General Aspects, Volume 2, Major Cheese Groups. 3rd edn. Elsevier Publishers, London. Kosikowski, F.V and Mistry, V.V. (1997). Cheese and Fermented Milk Foods, Volumes 1 and 2, 3rd edn. F.V. Kosikowski LLC, Westport, CT.
Law, B.A. ed. (1999). The Technology of Cheesemaking. Sheffield Academic Press, Sheffield. Robinson, R.K. and Wilbey, R.A. (1998). Cheesemaking Practice. R. Scott. 3rd edn. Aspen Publishers, Gaithersburg, MD. www.cheesescience.net is a small website maintained from time-to-time by Prof Paul McSweeney and contains brief snippets of cheese science, dairy chemistry and items of general dairy interest. This website is maintained to enhance public access to information about cheese science in general and our work in particular. Our goal is to keep this information timely and accurate. If errors are brought to our attention, we will endeavour to correct them promptly. However, no responsibility or liability whatsoever is accepted with regard to the information on this site. ● sometimes linked to external sites over which we have no control and for which we assume no responsibility.